AIIMS Rishikesh Staff Nurse Admit Card 2017 - AIIMS Rishikesh ANS Staff Nurse Grade II Notification 2017 - AIIMS Rishikesh ANS Staff Nurse Grade II Admit Card 2017 – www.aiimsrishikesh.edu.in. 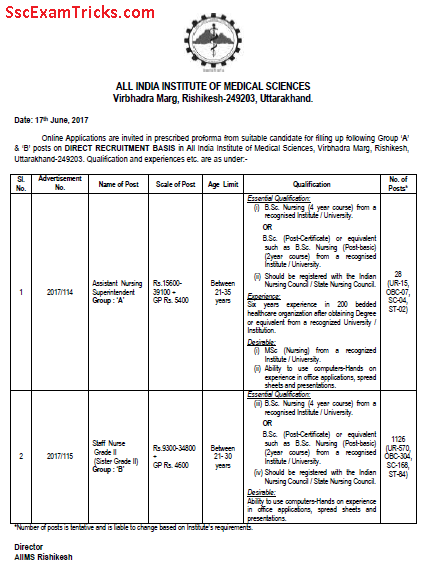 All India Institute of Medical Sciences (AIIMS) Rishikesh had released notification and invited applications from 17th June to 10th August 2017 for 1154 posts of Assistant Nursing Superintendent and Staff Nurse Grade-II. Many candidates are ready to apply for this recruitment and many others have submitted their online application forms on the official website. AIIMS Rishikesh Staff Nurse Admit Card 2017 - All India Institute of Medical Sciences (AIIMS) Rishikesh will release Admit card about 15 days before the exam to be held November/ December 2017 at various Exam centers for the posts of Assistant Nursing Superintendent and Staff Nurse Grade-II. 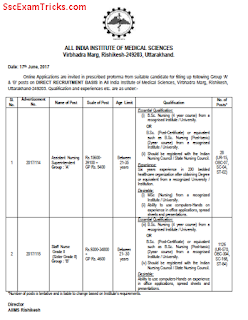 Those candidates who had applied for these posts and waiting for their AIIMS Rishikesh Assistant Nursing Superintendent Staff Nurse Grade II Call letter 2017; they can download it from direct link given at the end of the page.